Born To Run by Christopher MacDougall is the story of the Tarahumara Indians that live in the isolated Copper Canyon of Mexico. The story contains adventure, a secret society, long distance running, Stanford, Nike, more running, Leadville, and more adventure. Yes, you read that correctly. Nike and an isolated tribe are in the same book and part of the same story. How is that possible? 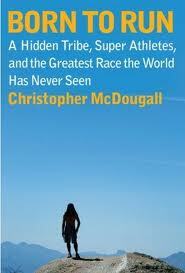 In my view, the book is two separate parts that intertwine through long distance running. The main part of the book is the story of the Tarahumara and how they are able to run such long distances with little gear and little food. The secondary part is about the science behind the minimalist/barefoot running movement. In the end, it all connects together and makes for a great read. I certainly found myself dreaming of long trail runs as I read it and I’m not even a real runner. Deep in the Copper Canyons of Mexico, the Tararhumara live a simple life, but very few outsiders have ever seen them, much less met and interacted with them. They are very elusive and are almost ghost like with the way they can appear and disappear. One American man managed to find them, meet them, and learn to live like them. His name is Caballo Blanco and he is the link between the author and the Tararhumara. Besides their ability to appear out of thin air, they are some of the world’s best ultra distance runners. They run up and down the canyons with ease. Their children play games that involve what we would consider to be extreme running distances. And they do all of this with sandals that consist of a very thin sole tied to their feet. Imagine running for hours in the hot dry mountains with climb after climb. Now, imagine doing that day after day after day with little water or food during the runs. That probably gives you a good starting point to imagine the incredible runs of the Tarahumara. The runs are so impressive, they were “recruited” to run at the Leadville 100 for a few years. This is the best thing about the Tarahumara. They love running and reading the stories about their runs makes you want to love running too. Along with stories of the Tarahumara running culure, the book dives into the minimalist/barefoot running movement. Obviously if the Tarahumara can run 100 miles or more in such minimal sandals, there has to be something that makes that possible. I won’t go into all of the details, but the science is well laid out and makes sense. This is where Nike and Stanford come into the story. Stanford’s track coach, Vin Lananna, had his athletes running barefoot in the infield grass instead of wearing the latest Nike shoes that were provided. When questioned about it, the coach said that his runners sustain less injuries when running barefoot. Why? His position was that we have basically babied our feet and have gotten away from the natural position. If we run barefoot and strengthen our feet, there will be less injuries. The argument has some valid points. There are other stories about how some scientists who run studied the foot and the body, and came to the same conclusions – getting back to our natural positioning and strengthening our bodies is actually better than the latest super duper cushioned shoes. Any book that makes me want to get up and go running has to get a two thumbs up from me. I’m a cyclist for goodness sake, not a runner, but I wound up wanting to run instead of bike while reading the book. The final few chapters of the book tell the story of the final showdown between the Tarahumara and the best ultra distance runners in the world. It turns out to be a great race and the story telling is great. The book is certainly about the races, the adventure of trying to actually find the Tarahumara, and then getting to know them. But it also has a deeper revelation about why the Tarahumara are so successful. They live a simple life and actually love running. If we can all find that type of pleasure from our activities then maybe we too could run up the hills after 50+ miles with a smile on our face.